MinerBumping.com: J-Space or James Space? If you're a member of the mighty CODE. 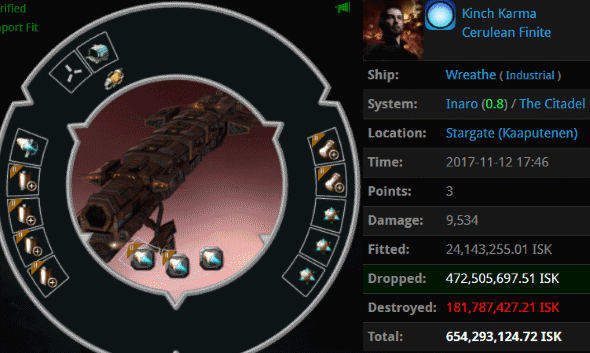 alliance, you're basically one of EVE's rock stars. The organization you belong to enjoys a level of name recognition rivaled only by the likes of the Goons and Pandemic Legion. Also, your individual character is probably famous, or quickly on its way to being famous. In circumstances like these, it would be easy to become disconnected from the common folk of highsec. Fame can create a certain distance. Ordinary EVE players look up at our Agents and think of themselves as members of their audience. But Code enforcers like Aaaarrgg don't want a bunch of anonymous onlookers and fans. Our Agents want a real relationship with the people they govern. When Aaaarrgg strode through the system, someone named Kinch Karma threw tomatoes at him. Our hero didn't simply move on. He engaged in outreach. Kinch was quite surprised to be called out. He didn't know how to respond, other than to deny being a miner. 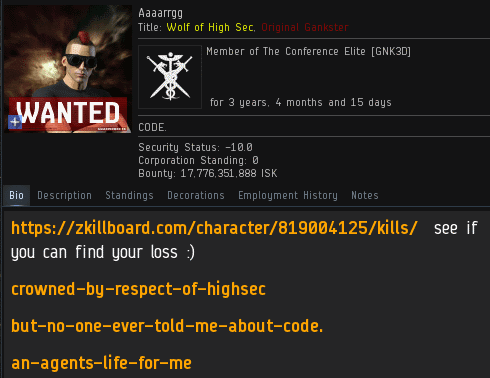 Aaaarrgg has lived in highsec for a long time. He knows that local tears like Kinch's don't simply "happen". There had to be a reason. But the miner refused to acknowledge his carebear status. To hear Kinch tell it, he'd never been ganked before. Yet this would leave his undisguised hatred for CODE. as something of a mystery. Aaaarrgg let Kinch know he was on to him. Granted, not all of the facts were in just yet. A full investigation would come later. But for now, Kinch had been credibly accused of bot-aspirancy. That was enough to go on. The first shoe dropped: Kinch identified himself as a resident of "J-Space". J-Space is a nickname for wormhole space used by people too cool to use the term "W-space". 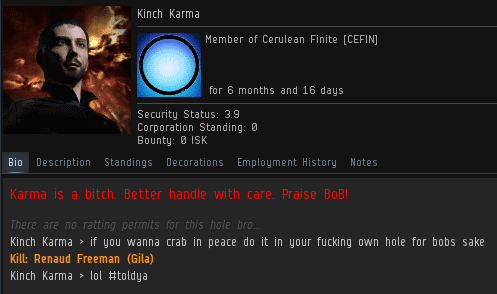 In his bio, Kinch made repeated references to "Bob", an in-joke used by EVE players who spend most of their time in wormholes. They pretend that Bob is the god of wormhole space. Silly roleplayers. So that was it, then. Kinch was an elite wormholer who only infrequently made trips through James 315 space. He wasn't some carebear who had been ganked by the New Order. Still, though... that hatred for CODE. Here's the thing about falling shoes: They tend to drop in pairs. Shoe #2 came in the form of Kinch's fail-fit hauler, which had been ganked only a few days earlier. And wouldn't you know it? The gankers in question happened to belong to the mighty CODE. alliance. Aaaarrgg confronted Kinch with this new evidence. The highsec carebear doubled-down on his "rah rah J-Space" routine. It fooled no one. Kinch spent far too much time in James Space to go running around without a mining permit. 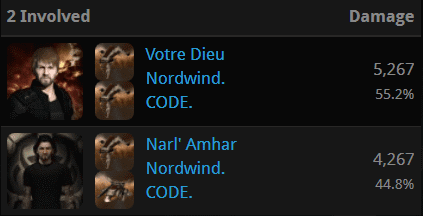 Friend, even if you choose to live in lowsec, nullsec, or wormhole space, don't think yourself superior. Don't act like you're above it all. No one is above the Code. Had a feeling that lossmail was coming as I read and scrolled down the blog. They're so predictable; it's kinda cute (in a disappointing way). Only true balanced Karma can enlightenment come from. And accepting James 315 as the saviour of course. Kinch sounds like a beta male. It offends me when miners have karma in their name, how can any sub human miner think that space vandalism is calming or relaxing? Cane toads all of them. I laughed at how he felt the need to say he was doing "cool" wh stuffs. never forget that thomas en chasteaux's best mate ingame - Kalynn Shardani murdered his infant child and then killed himself. I-I'm not a miner, I do j-hole stuff, trust me bro! Wow, get off the drugs guys, its just a game. I might add, this code crap is probably the worst way to retain any new players to the game. Just saying. Have fun killing your hobby with your delusion. So cute you guys still delusional thinking high sec is yours, keep trying carebears james is the biggest baby amongst you. "WHA I don't like the rules and I cant kill anyone in a fight so I'm going to claim the unclaimable spaces and kill people without weapons and claim that I'm elite."